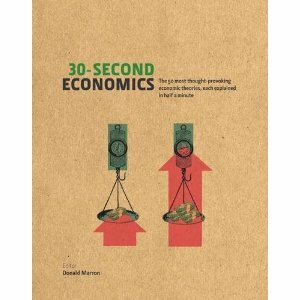 One of the themes of this blog is that economics is everywhere in daily life. Property rights, for example, are at the heart of everyday battles over overhead bins, shoveled-out parking spaces, and food in shared refrigerators. Continuing in that vein, a friend recently sent me a link to an amusing piece about sharing guacamole. I hesitate to link to it, since this is a family oriented blog, and the piece is decidedly R-rated and NSFW. So I will hide the link under the fold. The basic set-up is that a sort-of-advice columnist named Chris provides humorous answers to reader questions. [Dear] Chris: My fiancée makes amazing Guacamole, but it leads to the following problem: she only makes one bowl of it, which we then share. The issue is, I like to utilize small amounts of Guac on each chip in order to maximize the amount of time I get to enjoy the sweet green stuff, while she likes to heap massive amounts on each chip, in an effort to eat less chips (which […] I find laughable). This drives me crazy as I always end up with the short end of the Guac stick, and so lately I have been separating the Guac into two equally-sized bowls once she’s made it, in an effort to preserve my fair share. She thinks this qualifies as me being [a jerk] and says I “must have failed sharing in Kindergarten”, but on the contrary, I think it’s her poor sharing that’s lead to the whole situation. [Dear Letter-Writer:] Well, the obvious solution here is for her to make MORE guac. The other solution? Ask her the recipe, and then begin making it yourself. As head chef of the household, you are in full control of when that guacamole will be presented for consumption. I cook for my wife because it allows me the freedom to eat half of what I’ve made before it even reaches the table. Furthermore, the strategy of using less guac per chip is fatally flawed. It’s guacamole. All guac is first come, first serve. You must heap as much guac onto one chip as humanly possible (as your fiancée does), only do it at a much faster rate. Think guacamole isn’t a race? IT IS. The faster you eat, the more you get. That’s how it works. And it’s a crucial strategy to exploit when dealing with guacamole, nachos, pizza, wings, and other shared food. Do not hesitate. Don’t even […] chew. You inhale […] until there’s nothing left for her. That’s what I do. If you were out to eat with your guy friends at a Mexican restaurant, and you ordered guacamole for all to share, would you get [mad] at your friends for digging in too quickly? [Heck] NO. That guac is chum, and you are the sharks. ATTACK ATTACK ATTACK. Never play defense with appetizers. There you have it, the world’s best explanation of the tragedy of the commons. Garrett Hardin eat your heart out. Let’s just hope we never find ourselves at a Mexican restaurant with Chris. The letter-writer deserves kudos for endorsing the standard (and effective) economist solution to this problem: well-defined property rights. And his fiancée? Maybe she’s a fan of recent Nobel Laureate Elinor Ostrom. 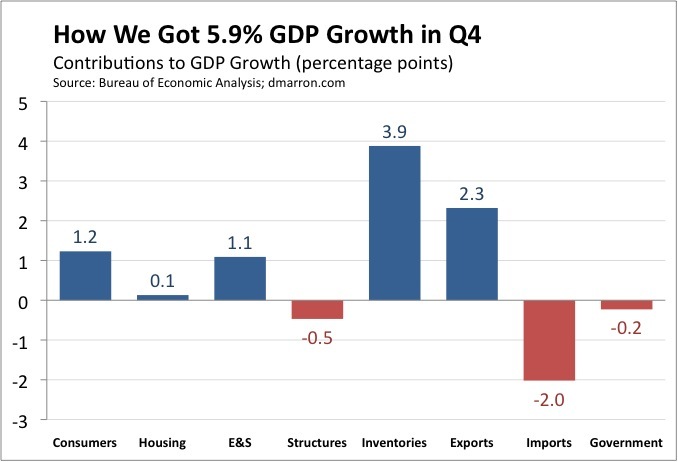 The economy grew briskly last quarter. According to the second estimate by the Bureau of Economic Analysis, gross domestic product increased at a 5.9% annual pace in the fourth quarter of 2009, a bit higher than BEA’s first 5.7% estimate. Almost two-thirds of the growth reflects businesses restocking their shelves and warehouses: inventories accounted for 3.8 percentage points of the overall 5.9% of growth. Consumer spending grew at a modest 1.7% pace and thus added 1.2 percentage points to overall growth (consumer spending accounts for about 70% of the economy and 70% x 1.7% = 1.2%). That’s down from the previous quarter, when cash-for-clunkers boosted car purchases. Housing investment also slowed, again in the wake of earlier efforts–the tax credit for new home buyers–that had boosted growth in the third quarter. Business investment in equipment and software showed signs of life, growing at a healthy 18% pace. That added 1.1 percentage points to growth, about half of which was offset by the ongoing decline in business investment in structures. Government spending fell slightly during the quarter. Stimulus efforts boosted non-defense spending by the federal government, but that increase was more than offset by a decline in defense spending and in state and local spending. Budget aficionados have long warned that the U.S. budget is on an unsustainable path. That’s old news (but important). The new news, which I hope you’ve noticed, is that those warnings have become more urgent over the past year or so. Why? Because our future problems have moved much closer. Joe’s chart shows two projections of the U.S. publicly-held debt. The blue line shows the history of the debt (measured relative to the size of the economy), as well as a projection of the future debt based on analyses by the Congressional Budget Office released in late 2007. 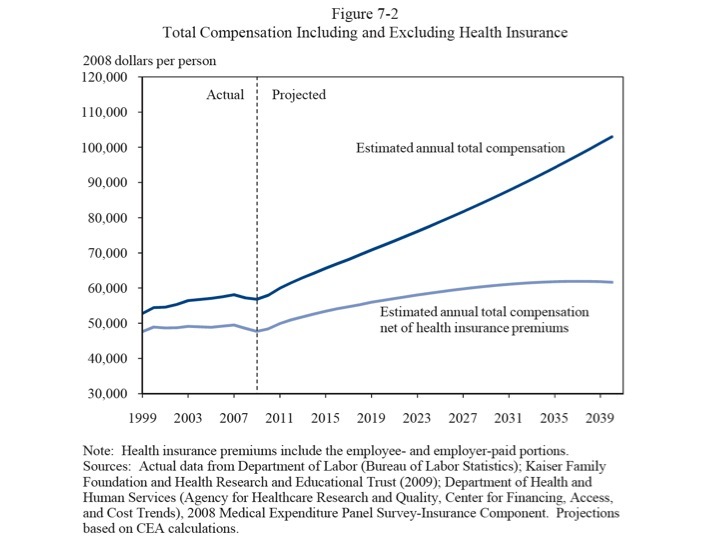 The red line shows a similar projection, but based on CBO budget analyses released in January of this year. As you can see, the day of debt reckoning has moved much closer. For example, our debt will hit 60% of GDP twelve years earlier than forecast (which Joe rounds down to a decade). And, of course, it will keep rising thereafter. Bottom line: The warnings of budget experts have become much more urgent because our room for maneuver has gotten much smaller. As I discussed briefly yesterday, Treasury has announced plans to revitalize its Supplementary Financing Program (SFP), which will effectively mop up $200 billion in excess reserves over the next two months. Even though this is a Treasury action, it strikes me as an important step (with many yet to come) in the Fed’s exit strategy. Still, one is led to wonder whether there might be a connection between today’s announcement about the SFP and last week’s announcement of an increase in the Fed’s discount rate. Numerous Fed officials encouraged us to interpret the latter as a routine and technical management tool. Are the discount hike and SFP renewal separate and purely technical developments, or is something more involved? If you are interested in these issues, I encourage you to read his entire post. As Confucius Lao Tzu once said, a journey of a thousand miles begins with a single step. The Fed faces just such a journey today: returning monetary policy to normal as the economy heals. And in case you didn’t notice, the Fed has already taken three steps down the road. Step 1 was the termination of various special credit facilities (e.g., the Term Auction Facility) that were created to provide liquidity during the crisis. Step 2 was last week’s sort-of-surprise announcement that the Fed was increasing the discount rate from 0.5% to 0.75%. Step 3 is today’s announcement that Treasury is reviving the Supplementary Financing Program (SFP). Over the next two months, Treasury will issue $200 billion in bills for the SFP and then place the proceeds in its account at the Fed. The SFP will thus mop up $200 billion of liquidity that Fed asset purchases have injected into the monetary system. Treasury began the SFP in September 2008 when the Fed needed help sterilizing the monetary impact of the programs it created to provide liquidity to the financial sector. The program peaked at more than $500 billion in late 2008, and then began to decline as sterilization ceased to be a Fed concern and as the federal debt limit began to loom. With the recent increase of the debt limit, Treasury again has room for the SFP, hence today’s announcement. Last week, the Council of Economic Advisers released its 2010 Economic Report of the President (ERP). I haven’t had time to read it yet, but I did take a quick spin through looking at the charts and getting a feel for it. The first thing I noticed is that the folks at the CEA have made an important innovation: the ERP now includes references to the academic studies, government reports, etc. on which it bases some of its conclusions. That’s a welcome break from a long-standing tradition (which I never really understood) that the ERP didn’t include references. A second useful innovation is that the ERP is available in eBook formats, including for my beloved Kindle. Not to add to their already enormous workload, but I look forward to the 2011 or 2012 version having dynamic graphics and live links to the references. 1. The boom and bust of house prices. 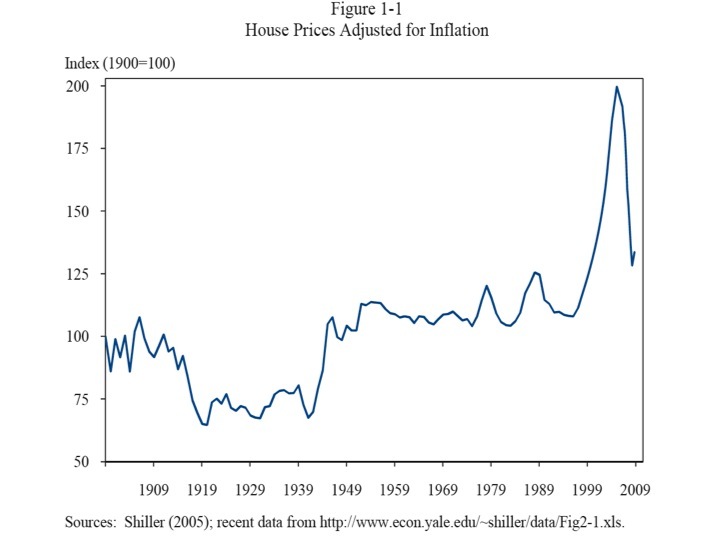 By this measure, house prices are still historically high–except for the bubble. 2. The declining role of banks in the financial sector. 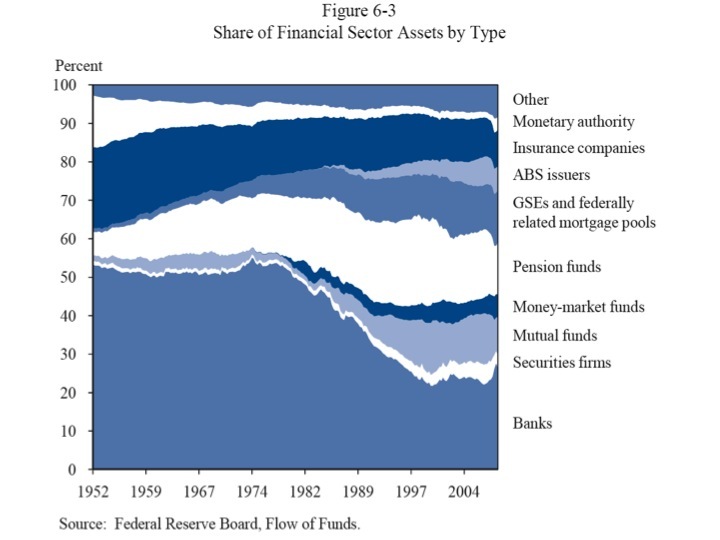 Note the growth of mutual funds and ABS issuers. 4. 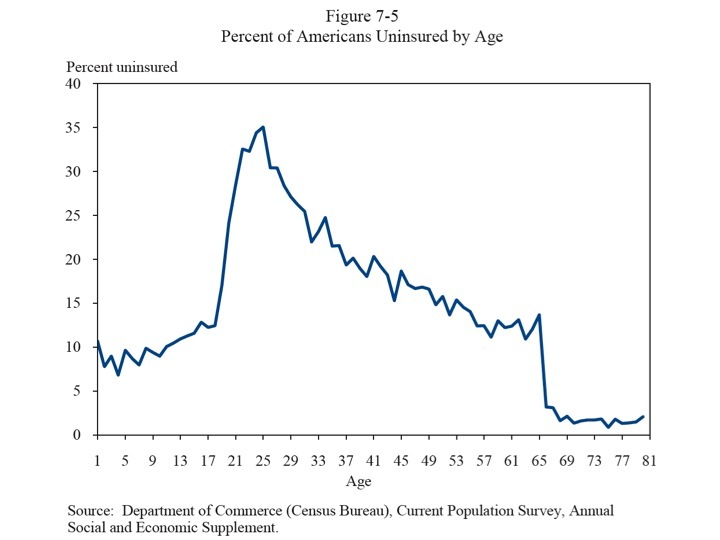 How the rate of being uninsured varies with age.